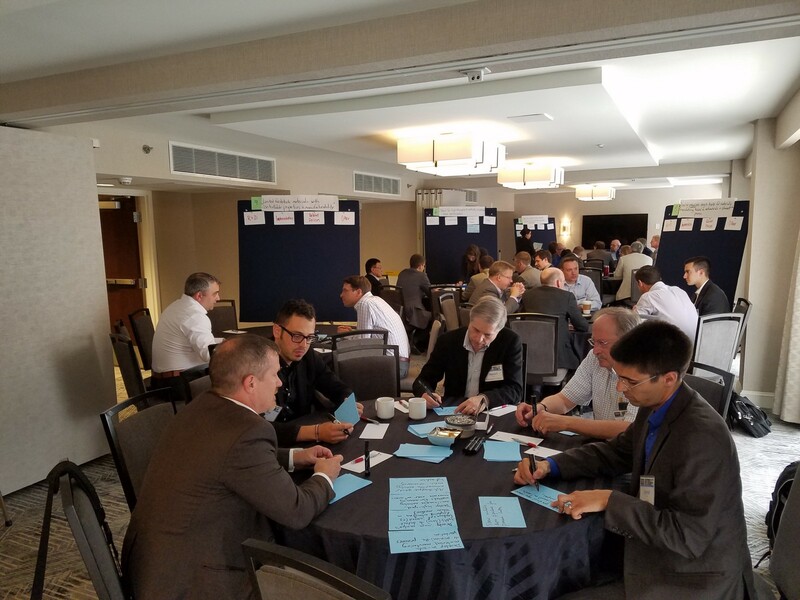 MForesight partnered with Dr. Chris Spadaccini from Lawrence Livermore National Labs to lead a workshop exploring the challenges and opportunities for metamaterials manufacturing in the United States. Approximately 40 experts from industry, academia, federal labs, and government gathered in Washington, DC on June 20 to develop recommendations for public and private stakeholders in the areas of research and development priorities, technology implementation challenges, and related policies. Experts generated ideas in breakout sessions throughout the day. Metamaterials utilize an engineered micro-structure, rather than relying on chemistry alone, to greatly expand the performance and combinations of properties that materials are capable of possessing. The workshop addressed the challenges to mass producing these advanced materials quickly and affordably. Basic and translational research focused on scalable and parallelizable micro- and nano-manufacturing techniques that excel at incorporating multiple, diverse materials. Research and development of measurement and real-time process control for high-speed production of complex chemistries and geometries. Shared manufacturing facilities and accelerated knowledge exchange between researchers, metamaterials manufacturers, and end users to accelerate the development and testing of metamaterials for targeted applications. Experts collaborate to develop recommendations to accelerate the realization of scalable metamaterials. 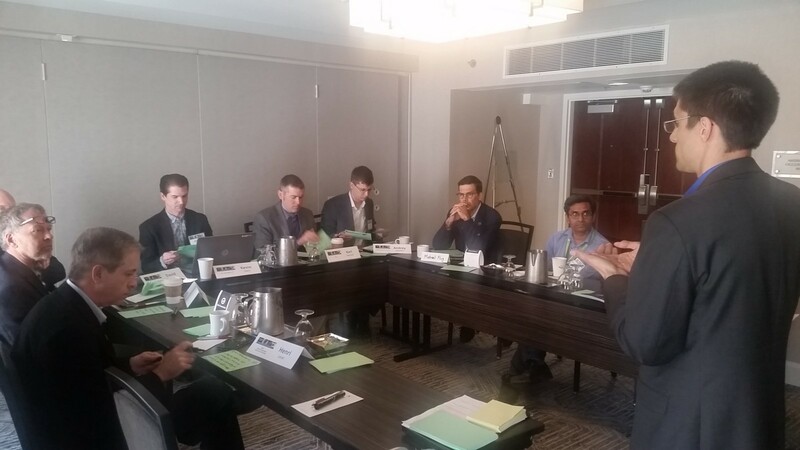 MForesight and the workshop steering committee will now work together to analyze and coalesce the extensive insight provided by the experts in attendance, in order to synthesis a set of detailed recommendations for advancing American competitiveness in metamaterials manufacturing. The final report will be available on MForesight’s website. Join our mailing list to receive notification when the report is published. Submit your ideas for MForesight’s next study on our Gamechangers webpage. In collaboration with MForesight, the workshop was led by Dr. Spadaccini, Dr. Carter, and the other members of the steering committee: Dr. Bernard Casse from PARC, a Xerox company, Dr. Clara Rivero-Baleine from Lockheed Martin, Dr. S.V. Sreenivasan from University of Texas-Austin, Mr. John Stetson from Lockheed Martin, and Dr. Jim Watkins from University of Massachusetts-Amherst. 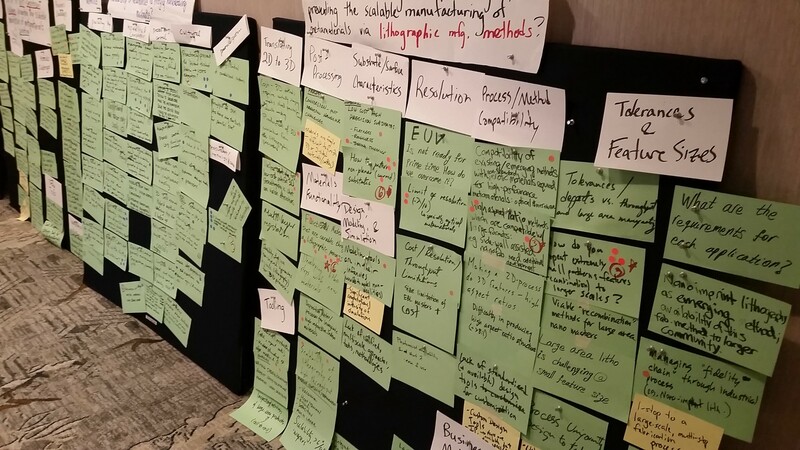 Poster boards full of ideas from workshop participants.